The name C.R. Gibson has been synonymous with quality for more than 140 years. Starting with the creation of the very first baby book in 1898, along with timeless baby keepsakes, families around the world have depended on C.R. Gibson as their number one provider of products that celebrate life's most cherished moments. Understanding the importance of preservation and craftsmanship, C.R. Gibson products offer a tradition of excellence and quality. C.R. Gibson sets a standard for style that reflects today's top fashions while creating a timeless treasured keepsake. The Bless This Child keepsake pillow is no different. C.R. 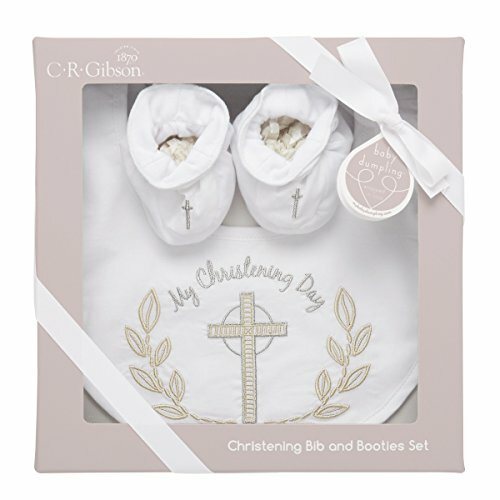 Gibson wanted to create gifts perfect for commemorating the sacred occasion of a baby's Christening. These Christening gifts will be the perfect addition to such a joyful event shared by close family and friends. Starting with the creation of the very first baby book in 1898, along with timeless baby keepsakes, families around the world have depended on C.R. Gibson as their number one provider of products that celebrate life's most cherished moments. If you have any questions about this product by Baby Dumpling, contact us by completing and submitting the form below. If you are looking for a specif part number, please include it with your message.